The wool market has progressed through another week sitting firm. The Merino market saw slight declines in the east and west but it’s the Crossbred market that’s attracting all the attention. For the fourth consecutive week, crossbred prices have risen which is a direct contrast to the seven consecutive weeks of declines in the Eastern Market Indicator. 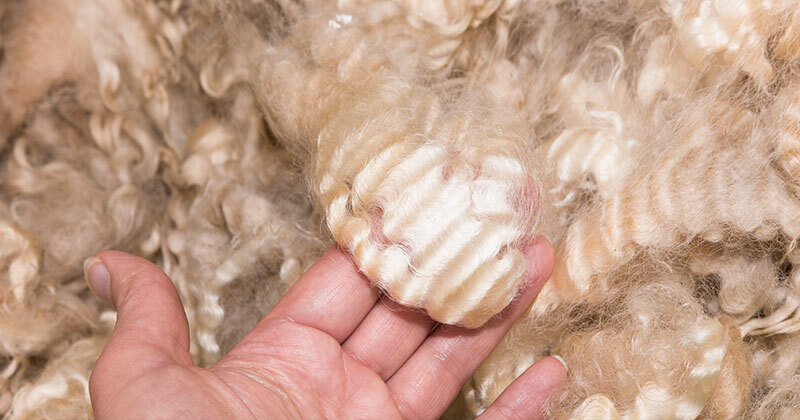 The increasing selection of low yielding wool was still a prominent feature of this week’s market. 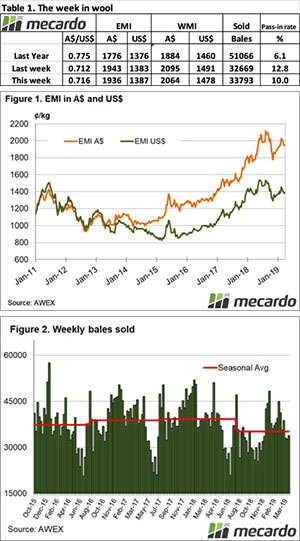 Despite the offering in Sydney being the smallest since AWEX records began (1995), the limited supply wasn’t enough to counteract the discounts on poor quality wool. The Eastern Market Indicator (EMI) eased by 7 cents to settle at 1,936 cents. The Au$ was slightly stronger at US $0.716. This was enough to put the EMI in US$ terms up 4 cents finish the week at 1,387 US cents (Table 1). In Fremantle, the Western Market Indicator (WMI) declined by 31 cents to finish at 2,064 cents. AWEX made note that the Western Indicator does not include crossbred types which explains why the losses in the West have been more substantial than in the East, they aren’t being supported by strong crossbred values. 37,527 bales were offered for sale this week. 10% of the offering was passed in which meant 33,793 bales were cleared to the trade. In the auction weeks since the winter recess, 1,158,527 bales have been cleared to the trade, 222,475 fewer than the same period last year. The average shortfall cleared to the trade compared to the same time last year now sits at 6,741 bales per week fewer. The dollar value for the week was $69.54 million for a combined value of $2.690 billion so far this season. A simple calculation of $ value divided by bales sold gives us $2,058 per bale across all types for the week. Crossbreds gained another 20 to 30 cents this week, and the 28 micron even hit a new record in the South, closing at 1,263 cents clean on Thursday. This weeks analysis article looked into the strength in crossbred prices compared to the broader Merino market so for a more detailed analysis read the article Here. The cardings indicator declined by 5 to 15 cents on the east coast, and gained 5 cents in the west. Week 42 of the season is the last week before the Easter recess. 42,487 bales are rostered across the three centres, with sales just on Tuesday and Wednesday.